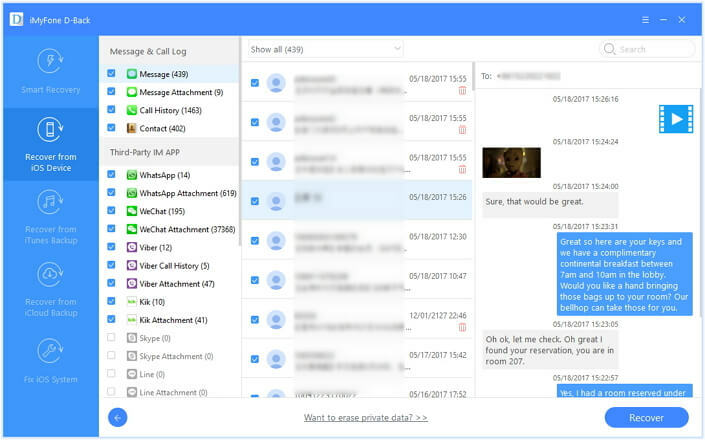 When you accidentally delete data on your device, getting it back can be very simple. All you need to do is restore the data from an iTunes or iCloud backup. But this solution is only possible if you actually have a backup of the data on your device. It is a lot more difficult and problematic if you didn’t have a backup of the missing data. It is not however impossible to recover the missing data even if you don’t have a backup. When you delete data on your device, the files are not completely gone. The system deletes the file marker to make space for new data. As long as you don’t overwrite the data on the device, it can be recovered with the right tool. To avoid overwriting the data, stop using the device immediately and then keep reading to find out how to recover the missing data. 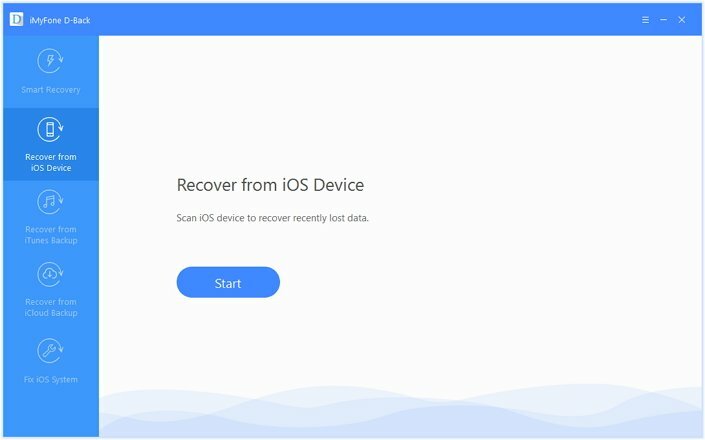 The best tool to recover deleted data on your device is iMyFone D-Back iPhone data recovery for Win or iPhone data recovery for Mac for a variety of reasons chief among them being the fact that it can be used to recover data from an iPhone without backup. The program has a number or really useful features including. It can be used to recover data directly from an iOS device or extract data from an iTunes or iCloud backup file. 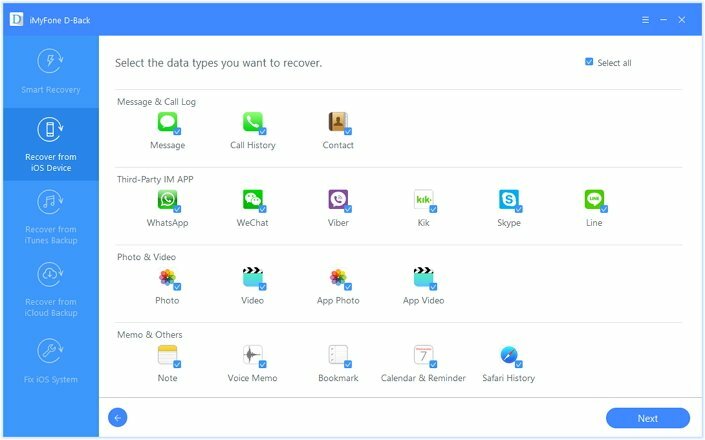 It can be used to recover up to 22 different types of data including videos, photos, messages, call logs, contacts, WhatsApp/Viber/Kik/Line/WeChat messages and many more. It has a preview function that allows for selective data recovery. It is very easy to use, fast and highly effective in data recovery. Download and install the program to your computer and then follow these simple steps to recover your deleted data. Launch the program and then choose “Recover from iOS device” from the main window. Click “Start” to begin. In the next window, select the type of data you want to recover and then click “Next” to continue. Connect the iPhone to the computer and once the program recognizes the device, click “Scan” to allow the program to begin scanning the device for the missing data. The scanning process shouldn’t take too long. Once it’s complete, select the data you want to recover and then click “Recover” to save the data to your computer. 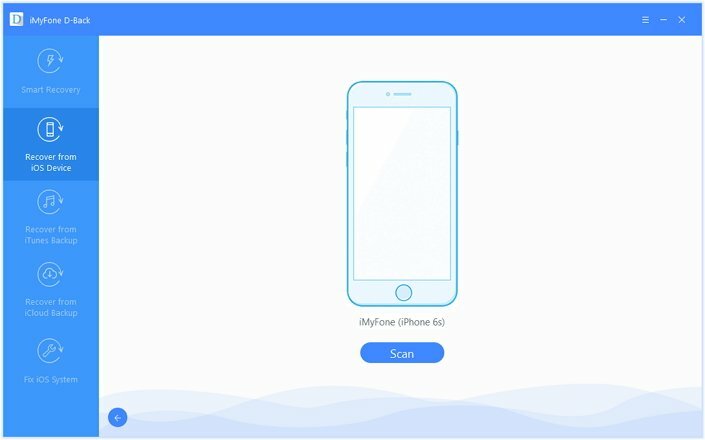 Now you can download the free trial version of iMyFone D-Back iPhone data recovery for Win or iPhone data recovery for Mac to check which deleted data on your iPhone could be recoverable. You can only prevent data loss through regular backups. It is often a good idea to backup data weekly on iTunes or iCloud. But if you have a lot of data, lots of photos you want to increase the backup frequency to maybe twice weekly.